It’s that time of year when the British ABRSM theory exams are looming – there are about 3 weeks to go and students are knuckling down everywhere. One of the hardest questions to self-assess is, of course, the composition question. I spend a lot of time working with students specifically on composition guidance, and from time to time readers of the website send in their answers to the question in the practice test on mymusictheory. 1. The piece is the right length – 8 bars, and you’ve balanced up the incomplete first bar correctly in the last bar. However, there is a lack of balance within the piece. It’s better to assume that 8 bars are divided into two halves of exactly the same length, and create two phrases (a question phrase and an answer phrase) of 4 bars each. This is really just one long phrase of 8 bars. 2. Exceptionally neat – nice work. 3. Two points, which are VERY common mistakes in students’ work! Firstly, barlines are dictated by notes, not by the end of the staff. In the 2nd and 3rd lines, you’ve drawn the barlines at the far right hand side of the staff. In fact you need to draw them close after the last note you’ve written. It doesn’t matter if there is a space after the barline (it’s not very neat, but it’s correct). If you really want to have your barlines at the end of the staff, then you have to carefully plan the notes you’re writing so that the last note you write is at the end of the line. Secondly, notes need to have the correct amount of space left after them. After a quaver (8th note) you need a very small space, bigger for crotchets, bigger again for minims. Spacing is relative. Notice how in the printed 1st bar, the dotted crotchet has quite a lot of white space after it before the next quaver is written. Leaving the right amount of space is an important visual clue for the performer regarding the rhythm. In bar 6, for example, you leave hardly any space at all after the minim D, but then a big space after the quaver rest. 4. Well, there are certainly a lot of them! But, (and this is an important point), it really does feel like you put your hand in a bucket of dynamics and then threw a handful at the music ;o) Dynamics MUST make musical sense. In bar 3, you write a P. Bar 4 contains no markings, so we must assume it’s the same – P. The first beat of bar 5, suddenly, is F. There doesn’t seem to be any logical reason for this – there’s no crescendo, and it’s not a new phrase. If you change the dynamic SO drastically, a new phrase would seem logical, but then again it’s not a good place for a new phrase…. In bar 6 you’ve written a decrescendo which apparently should be played through a rest (can you make a rest even quieter?!) and the mP marking should be aligned with the actual note to give it a solid meaning. You’ve written Allegro as a tempo, so one crotchet is going to whizz by very fast – there is not enough time to have a diminuendo on just one crotchet. Bar 8 has a similar problem. Phrase marks need to clearly end on one note, and a new phrase mark starts on the next note. You’ve written your phrase marks so that the end and then start on the same note. 5. Fine. It would suit a very flamboyant type of violinist! 6. This is the real weakness of the piece. You’ve tried to show off your (very good) knowledge of things like triplets, ornaments and syncopation. But in doing so, you’ve written a piece which has no connecting factors. The title of this post is “Less is More” and that really is the case in grade five theory composition. Don’t feel that you need to include everything you know about! When you begin a composition, you need to look carefully at the given opening, and decide what are the characteristic features of it. This means looking at what type of intervals the music is built on (does it move by step or in leaps, what kind of leaps? ), what kind of rhythms it uses (dotted, or syncopated, or whatever), and does it have any other striking features (in the dynamics, phrasing or articulation, for example). Then, you need to make sure that you keep those characteristic features in the music for the whole composition, so that there is a feeling of continuity. Obviously you can’t just repeat what’s there note for note – you need to make small changes so that the music is new, but connected. This can be something as simple as writing the same melody as the first bar, but with every note shifted up a step in the scale, for example. In your melody, I couldn’t find any examples of sequencing – of re-using bits of melody or rhythm in this way – every bar seems to be an invention of something new. It’s really a fundemental part of the composition question and something worth working on. 7. The final cadence is clearly a perfect cadence. 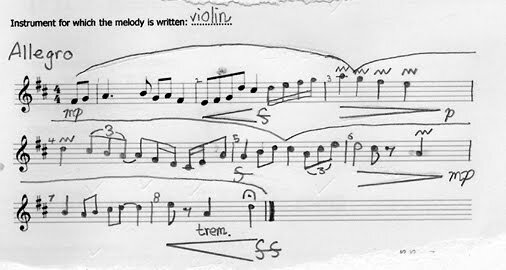 I’m not sure where the “middle” of your piece is supposed to be, so I can’t find a cadence there either! 8. You might think I’m a bit harsh only giving 1 point here. I can see that you’ve worked really, really hard and have tried to gain a lot of marks in this question, so I think you might be a bit disappointed with what I’ve given you. You are obviously a talented musician, hard-working and I would put money on you being a pretty good violin player yourself, am I right? I think you are throwing your energy in the wrong direction in this question – keep in your mind that this is a theory exam – not a practical. Your composition needs to demonstrate that you understand the principals of balance, sequencing, and underlying structure. If you were going shopping for a violin and played what you wrote in order to test the instrument, I think it would be perfectly appropriate – some bits of scales, arpeggios, big dynamic range and so on. But as a self-contained piece of music, it lacks the glue to hold it together. It leaves the listener feeling rather unsatisfied and wondering if that was really the “piece” or just the “warm-up” before the real piece begins. Don’t be discouraged, You show a LOT of potential. Read up on how to structure a composition and keep working at it! Sitting my g5 tomorrow. All i can say is that this was a VERY helpful analysis-thanks! Initially, upon seeing what was written, i thought blimey, that looks complex compared to what i usually write! I then saw an 8/15 and was dismayed that such a complex looking piece scored so lowly. After reading your break down i was relieved- i agreed with pretty much everything you said and can see how 8/15 was a fair mark, but im glad that the simpler pattern based style i usually employ would by your marking score much more highly. I really would recommend to people to just play about with some simple patterns for an 8 bar composition. Its infinitely easier, probably sounds better and scores more marks! I’m taking my Grade 5 in just less than 2 weeks. This is the question I’m terrified of. I cant find a simple method of helping me to compose an 8 bar melody…..I know all the rules such as cadences, sequencing, bars 3 – 4 using notes from I and V, bars 4 – 8 going something along the lines of I, IV, V, I but actually applying that to physical notes I just hit a brick wall. Even to the point of writing out the tonic, 3rd and 5th of I, II, IV and V for the key signature, and trying to build a jigsaw of music using the cadence sequence and notes from the appropriate section of the tonic, 3rd, 5th etc, I still just draw a blank.